Molly Fletcher and I designed and made The Speaking Machine for a new performance called Xhumed - Dead Good Thinking conceived by Samara & Jason Hall-Jones of Xhumed BHX13. It was performed at the New Library of Birmingham and was a series of, what can only be described as, TED style lectures but with dead people. Erasmus Darwin, the grandfather of Charles, described a talking Machine and our job was to create his vision. 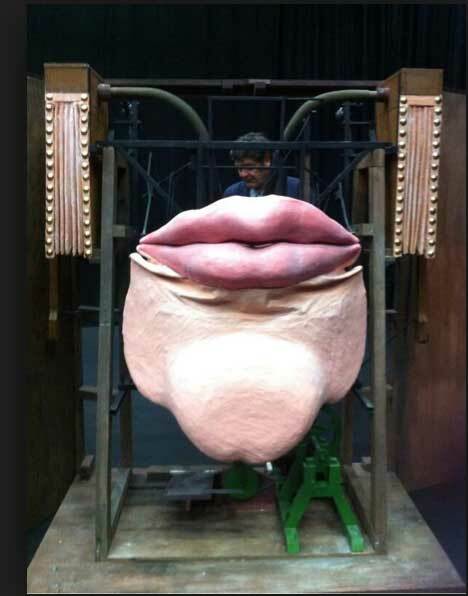 He wrote "...I contrived a wooden mouth with lips of soft leather, and with a vale back part of it for nostrils, both which could be quickly opened or closed by the pressure of the fingers…. or which if built in a gigantic form, might speak so loud as to command an army or instruct a crowd." Erasmus Darwin (TEMPLE OF NATURE). We added the chin and teeth to make it more theatrical and indeed in the second performance the audience, when commanded to stand, did so.